Ever notice how some people seem to be lucky — good things seem to attach to them like moss to trees. They seem to have great careers, exciting lives, and fulfilling relationships. So let’s say you are not living up to your potential. Let’s say that you are not in a fulfilling career, life or relationship. How do you change your luck? Here’s how to take control of your future. A doctor can’t practice medicine without a degree and residency. If you don’t like your career, retool. Go back to school to learn a new craft and work really hard at it. Don’t quit your existing job — educate at night while still earning your day pay. Commit yourself to learning your new craft with an insatiable desire. Working hard brings about a lot of luck. Make it your mission to outwork everyone on your team. It doesn’t always mean working longer hours than everyone else, it means working smarter than everyone else. Be organized, learn from mistakes, find ways to make your work style more efficient, and tweak your activities until they produce bigger results. Make goals, big audacious ones, and see them through. Track your progress and shift gears if the goal becomes elusive. Study others that have accomplished similar goals, introduce yourself and have candid conversations with them as to how they accomplished theirs. Mimic their behavior and activities to meet your goals. 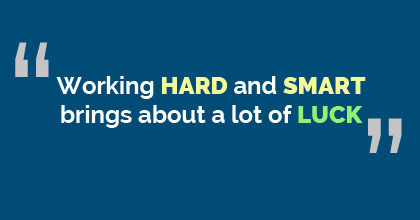 As you begin becoming lucky through all this hard and smart work, share your success with others. Help others that have a desire to accomplish something big but just haven’t put together the pieces to make it happen. Be a mentor. Your future belongs to you. Why not take control of your future and accomplish things you keep putting on the back burner? No more excuses, work hard and smart and get it done. If you would like to share some recent successes, tell us about them in the comments below. This entry was posted in Lifestyle Freedom and tagged big audacious goals, educate yourself, education, entrepreneur, goals, help others, success, work, work hard, work harder on November 30, 2015 by Steve Miller.